The German Zwiebelfleisch - Viennese Roast Beef or also called Zwiebelrostbraten is a classic German dish that is served in many regions of Germany, like in Franconia, Thuringia, Berlin, Hessen, Swabia or Vienna. If you would translate it literally it means "onion-topped roast beef with gravy". The recipes vary by region. I want to feature today the classic variation: Wiener Zwiebelrostbraten - Viennese Roast Beef. In Austria the dish will be served in almost every restaurant of the former emperor's capital Vienna. The onions will be roasted with the meat and a bigger portion will be roasted separately and be placed over the sliced meat. 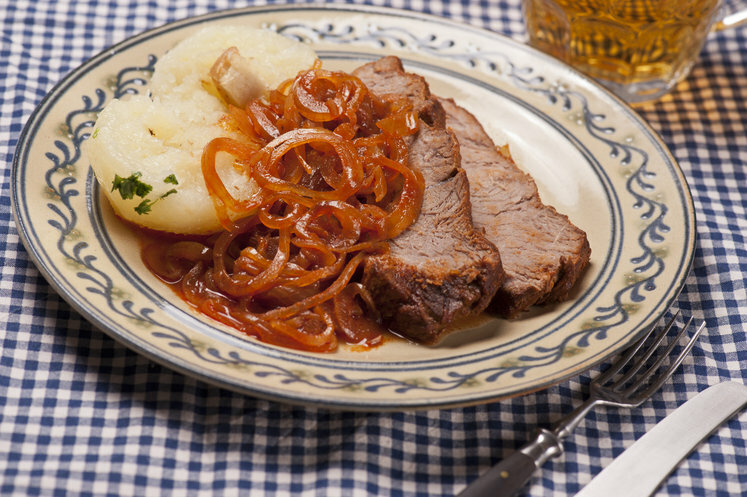 The meat used for Zwiebelrostbraten is traditionally a standing rib roast cut, which is called “Rostbraten” in German. The dish will be served with a gravy and roasted onions, and as a side dish you can choose from dumplings, Spaetzle, boiled potatoes or fried potatoes; Brussels Sprouts, carrots and peas or red cabbage. Happy Cooking! - Tenderize the beef a bit, and cut the slices at the edges several times. - Slightly salt and pepper the slices. - Turn them in flour. - Peel onions, cut them in thin rings. - In a large skillet fry 2 meat slices (not more) evenly on both sides. - When done keep warm (wrap in foil). - In the same skillet add 1 Tbsp butter and roast 1-2 onions until the rings are brown. - Place the beef slices into the skillet. - Add some broth and saute them until tender. - Meanwhile dust over remaining onions some flour and fry them in oil until they are golden brown; you can use a deep fryer. Add salt to taste. - Place the beef slices on warm plates, add some of the juice and place on top the fried onion rings. Serve with your favorite side dish such as Spaetzle, pasta, dumplings or potatoes.